Yapease Quarry Sites is part of the Tentative list of Palau in order to qualify for inclusion in the World Heritage List. Palau’s best chance of a second WHS is the serial transnational nomination of the Yapese Disk Money Regional Sites / Yapese Quarry Sites. This collection of 4 locations in two countries has already been brought forward in 2010, but ended up with a Deferral advice from ICOMOS and a subsequent withdrawal of the nomination by the Federated States of Micronesia (representing Yap) and Palau. They will try again in (possibly) 2018. Palau played an important role in the origin and practice of the use of stone disk money on Yap. 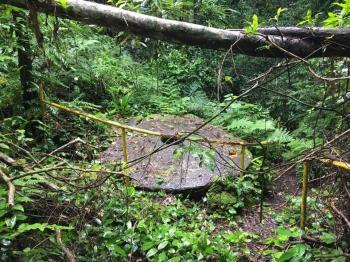 Although the island state lies almost 500km away, with its fine limestone it provided the source for producing the large disks that were used on Yap as stone money. In 1883 it was reported by judicial commissioner G.R. Le Hunte that he found around 100 Yapese at Palau cutting stones and preparing them for transport. The two locations on Palau included in the original nomination are called ‘Uet el Doab ma Uet el Beluu’ and ‘Chelechol ra Orrak’. After the discussion we recently had on the Forum and some further research, I’m quite sure that both are located on the island of Orrak (the former in the interior, the latter near the beach). I found the original ICOMOS evaluation of 2010, which sheds further light on the boundaries of this nomination. The locations on Orrak Island are both quarry sites. Orrak is a tiny island, which was connected to Airai Village in Babeldaob “by a prehistoric causeway constructed of coral rubble now covered in mangrove vegetation”. From the harbour of Airai this causeway is still visible, although it’s also easy to see that it is broken down by water in one or two places. The Yapese did not just go and take the stone disks from Palau: they had arrangements with the traditional owners of the lands for the quarrying rights, and brought gifts from the chiefs of Yap to the chiefs of Palau. In the case of Orrak Island, this meant the chiefs of the village of Arrai. In its evaluation, ICOMOS argues that there is at least an intangible relationship between the quarry sites on Orrak and the village of Airai. Therefore the village itself could be part of the revised nomination or at least the buffer zone. On my first day driving around Babeldoab, I checked out Airai too. 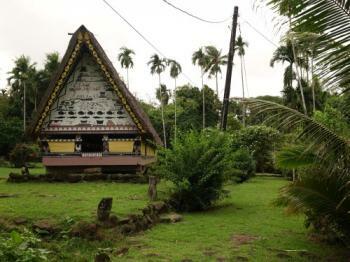 It has probably the finest example of a traditional bai (men’s meeting house) of Palau. Unfortunately I did not have the time to arrange a visit to Orrak Island while on Palau, although I was tempted to speak to one of the fishermen present at Airai to take me across. Which locations finally will end up in the new nomination is not clear: ICOMOS requested a further justification of the selection of these two sites on Orrak Island, as there are at least nine other documented quarry sites on Palau (including the already inscribed Omis Cave (part of Rock Islands WHS) and the one tourists get sent to, Metuker ra Bisech). I reached only one site from Yapese Stone Money Quarr - Chelechol ra Orrak, they call it Metuker er a Bisech. The site is located in a small island belonging to Airai State. At the time I was there, only one tourist agent was organizing 2-hour trip to the site (it could be shorter or longer depending of your climbing skills). I do not remember their name, but it is easy to find them because the office is located just under the big bridge connecting Koror to Babeldaob (the big island); it'll be on your left hand side when you drive from Koror - just cross the bridge and then make a U-turn, choosing the road that goes under the bridge; this is the last building on your right now. You will hear that at least two people are needed to organize a boat for that trip, but if you insist and show how much you'd love to see "this unique Palauan treasure" they do it only for you. That's what happen to me; we agreed the day, the time. The price is fix: 35 USD for the trip plus 25 USD for kind of a permit to visit historical places in Airai state. If you have paid it already in Airai State Office, you'll just have to pay only for the tour. After 25 minutes boat trip you land at a provisional harbour, and then you have to climb up for another 20 minutes. The path is steep, but marked with a yellow handrail, sometimes broken. As this is a jungle and not many people are visiting the site, you'd better have good shoes and long trousers. When I was there the humidity reached almost 100%, lots of small insects in the air and on the ground, so it was not very pleasant experience but worthy! Don't count on a guide! The man who brought me there stayed in the boat. There are some informative boards, but old I think and it was really difficult to see any explanations. First you reach an example of a big stone money that was broken when transported from the quarry, that's why they left it here. It is surrounded by a yellow fence. It is really big! And it is here that I started wondering: why? why they were doing it? If you follow the yellow handrail (there is no visible path anymore, so go through the bushes and fallen trees) for another 10 minutes, you'll reach the quarry itself - just two big caves one opposite the other. There's another info board illustrating how the whole process looked. And if you follow the yellow handrail for another 20 minutes, going up, very steep (no trace of a path at all, I had the impression it was longer), you can see one more big money, unfinished. Then I got back to the boat and we came back to the starting point (the office). My boatman showed me some relics from WWII, some mussels farm and also one cave we got into. And that's it.